New Kona dropouts finally available! Thread: New Kona dropouts finally available! 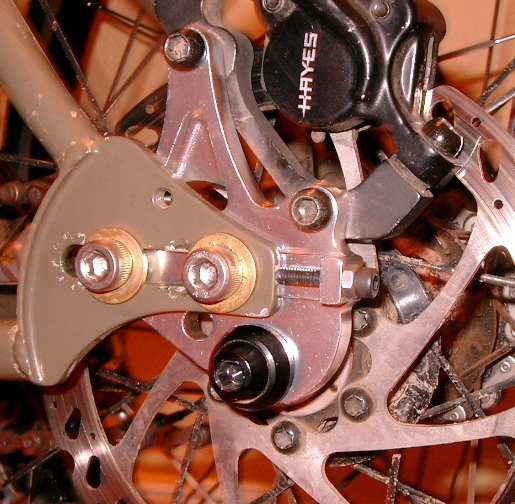 I ordered the 2007 dropouts with the new tensioner screw from my LBS in November. Today they arrived and I retrofitted them on my 2005 Unit 26". So, for those of you with "sliding problems" who have been waiting for these to become available - go get 'em. Those look awesome. Thanks for posting that pic. SWEEEET! About time. I am quite happy of course. THANK YOU KONA. I ordered mine last week. I entered the tracking number into Fedex.com today and they are "on-truck for delivery". I will install them tonight and then post some pics. I will also post pics of my entire bike as none of you hava seen it yet and I am quite proud! Here is mine, just got it installed. Nice, I like the penny's. Don't they bend? Oops, looking closer they are just copper washers. But I'd still think they might be too soft for that application. Still looks cool.